Our adoption will be finalized on January 10th... and Jon's Grandpa Packard will be sealing us on January 26th in the St. George temple. We are so excited that this part of the journey is almost complete. Our adoption has gone by very quickly. I can't believe JT is already 6 months old. The Lord is definitely looking out for us. We are so blessed. I can't wait to become a forever family with my son!!!!! I found out how to get on your blog yea. Jt is getting so big. I can't belive hes crawling. Brielle is close. 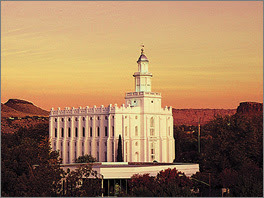 Thats so exciting you guy get to go to the temple in a few weeks. You will have to let me know what time so I can come up.Our adoption is taking its own sweet time. It will be feb before we can go. That is amazing. We are so blessed to have eternal families. I am so happy for your sweet family. Congratulations you guys. That is such wonderful news! You deserve it after all these years of waiting.